Do you know this character? Yes, some of you maybe know Yamada Miiko from Hi Miiko! Comic. She is the first child from Yamada family. But her personality sometime doesn’t present her like a big sister. Meanwhile her younger brother, Mamoru is the perfect example of a big brother. If you read the comic, you may know how dependable Mamoru is. Yes, Miiko is very clumsy. But I still love Miiko no matter what. She’s very cheerful, positive, and a good child. She always trying so hard to make people happy. There is one very touching moment when she asked all of her classmates to ask her hospitalized friend to continue their drawing. So her sick friend still feel that her friends didn’t forget about her even though she wasn’t go to school. Well, I think this comic probably for young girl. But I still enjoy reading it, especially when it comes about romance! I know, it’s not like a mature romance, but more like a young fool love story. In this comic, there are two boys that like Miiko, they are Tappei and Yoshida. Unlike Yoshida who is very sweet and loving to Miiko, Tappei is very different. He shows her love with joking and playing around with Miiko. But sometimes, Tappei can be a very romantic boy in his own way. How lucky she is! 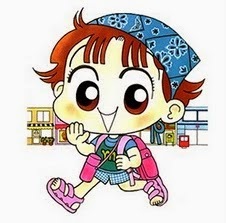 Miiko is my favorite Cartoon Character. What’s yours? I never heard about this Lia.